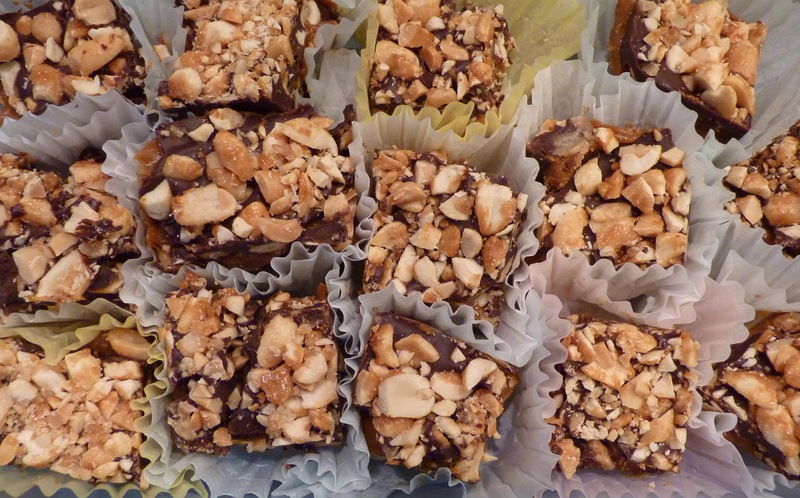 The Tuesdays with Dorie bakers made Snickery Squares before I joined the group. I’m not sure where I first saw them – on someone’s blog or in the book, but I’d been wanting to make them for a long time. So when my husband needed a treat to bring to work, I knew this recipe would be the one. Buttery crust, a layer of dulce de leche with a sprinkling of caramelized peanuts, topped by a layer of chocolate and more caramelized peanuts. Sweet, creamy, salty, and crunchy, all in one bite! I made the full recipe with no changes. I baked the crust and caramelized the peanuts one day, and then assembled the bars the next day. I let them chill overnight and cut them into squares the next morning. After sitting out on the counter for a while, the chocolate was still pretty hard to cut, but the dulce de leche was pretty soft, so these were messy to cut and to eat. Since they were messy and I don’t like messy, I put each square into a muffin liner, and then put them all into a plastic container to be transported. I’m not sure how many squares I ended up with, but I cut them much smaller than what Dorie recommends. How it went: I was nervous about making caramelized peanuts, but it went great! The couple of times I’ve made caramel following Dorie’s directions, it has worked out well. There are a few components to this recipe, and with cooling time, it does take a little while, so I was glad that I split the tasks across two days. How it tasted: It’s a miracle that I didn’t eat all of the caramelized peanuts before putting the squares together! They were SO good. But the assembled squares were delicious, and much better than a candy bar. They didn’t last long at my husband’s office! You can find the recipe in Baking: From My Home to Yours, or you can find it here on Dinner and Dessert. I liked this one. Definitely one that I had to share, since they were so tasty. I like that you put them in muffin liners. Very pretty! Ooh. I’ve been dying to rewind this one. I just need to find someone to foist them off on….hmm, husband’s office maybe? They look amazing. Yum, yum, yum! I have been dying to make these since I bought Baking three years ago. 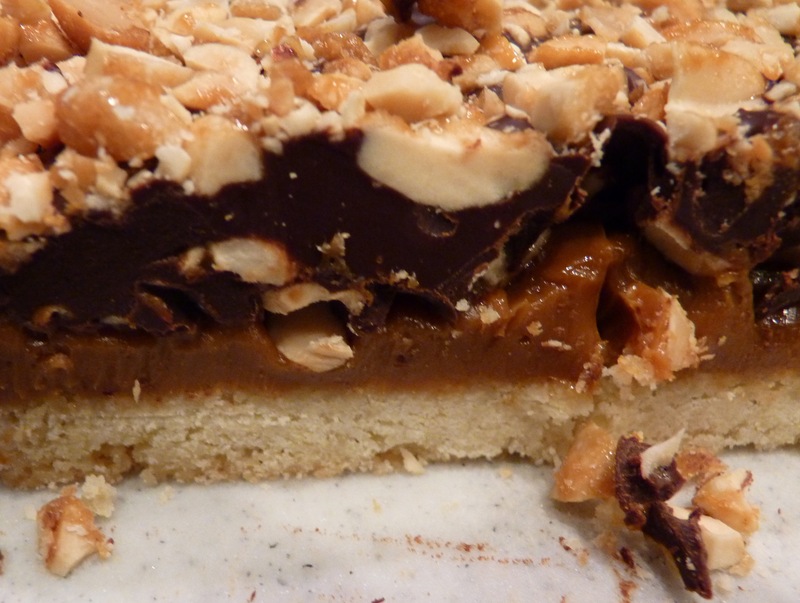 I have little control around regular Snickers, I can only imagine how good a homemade version is. I thought about making them for the Thanksgiving-rewind (It was on the schedule also befor I joined the group). I just love anything peanut! Yours look perfect! When I couldn’t find the figs for this week’s cake this was the recipe I wanted to rewind, but I couldn’t find the time. I’m so glad they lived up to expectations, I’m definitely going to get to them eventually! I loved these when I made them too. Yes, they were messy (and I even cut down on the dulce de leche a little). But weren’t they great? These were messy, but, OH, I loved them so much!!! Yours look great! These look so rich, but so good. I wish I was there to snag some of the caramelized peanuts. Yum! OMG, these look so good! This was also before I joined the TWD group – perhaps I could make these for my rewind later in the month. I got all the ingredients to make those last week as well…lol! I didn’t make them, though, so maybe this is a sign that I should do that asap! I love how you put them in the little wrappers. These look like the scones from our local bakery. I’ve been trying to find a recipe to replicate them and this could be the one! Thanks so much for the post.